Research papers: that are presenting and discussing the latest, and the most profound research results in the scope of IJNCAA. Papers should describe new contributions in the scope of IJNCAA and support claims of novelty with citations to the relevant literature. Technical papers: that are establishing meaningful forum between practitioners and researchers with useful solutions in various fields of digital security and forensics. It includes all kinds of practical applications, which covers principles, projects, missions, techniques, tools, methods, processes etc. Review papers: that are critically analyzing past and current research trends in the field. Submitted papers should include at least 8 pages and we are highly recommending authors to give references to at least two previously published papers in this journal. Referencing to previously published papers of our journal shows your interest as well as continues involvement in the field and as such would increase the chance of paper acceptance. Manuscripts submitted to IJNCAA should not be previously published or be under review by any other publication. The papers can be submitted only in English throughout the year. All papers should follow this template. The Copyright form must be downloaded and signed by at least one of the authors and e-mailed to ijncaa-(at)-sdiwc.net. Submissions will be peer-reviewed by at least, two members of the editorial board and, in cases where outside expertise is required, by invited peer reviewers. The papers will be assessed according to two criteria – technical content and linguistic consistency. The technical content criterion is concerned with the originality, significance and technical level of the work. The linguistic consistency criterion addresses the level of written English and layout of the paper. A native speaker will check the papers submitted for linguistic consistency. The level of written English of submitted papers will be ranked between 1-5 where one (5) is for paper with excellent English and 1 is for paper whose English is subjected to major revision. Top three (3) levels will be considered for acceptance. The lower levels will be proposed for revision and could be conditionally accepted. 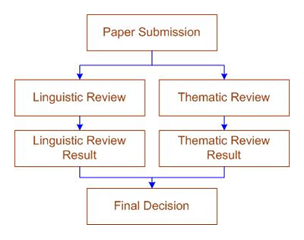 Thematic review will decide whether to accept or reject according to the originality, significance for theory and practice, quality of content and presentation of submitted paper. Papers satisfying both criteria will be considered for acceptance. Papers failing one of the two criteria will be recommended for revision and could be conditionally accepted. The feedback results would be emailed to authors no matter the paper is accepted or rejected.